There's a reason Rowan Dakar is known as the Dragon Breaker. The last thing he needs is to fall for a woman who literally sets him aflame every time they kiss. 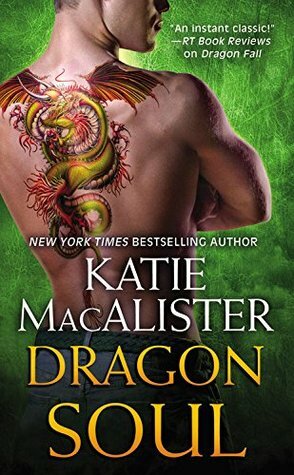 I love reading new authors and Author Katie MacAlister is one of my newest authors. It is interesting that this author is the second author I have read this week that bases some of her characters around mythology. This book is filled with humorous innuendos and bantering that bounces the reader back and forth between characters and conversations. This being the first book that I have read that used this throughout the book I had a difficult time at first staying up with the story line. After I relaxed, just let it be and quit trying to organize things in my head I enjoyed it as part of how they communicated. It has an enjoyable fast paced plot that at times confused me with all the characters and their relationships to each other. In spite of that it really can be read as a stand alone but for me, I believe this is a series that is best read in order to get the full benefit of the story lines. I think it is time to read the first two books. Will you join me?